Can the future of fuel be full of trash? It might just be. Non-traditional resources and new conversion technologies are critical to expanding the biofuels industry. And a new report shows that innovative sources can lead the way. This is the message issued by the Department of Energy's Pacific Northwest National Laboratory that says the Northwest can have a sizeable biofuels industry based primarily on local resources -- if non-traditional feedstocks, such as municipal waste, and new conversion technologies are used. According to the report, Biofuels in Oregon and Washington: A Business Case Analysis of Opportunities and Challenges (pdf), it will be difficult for the Northwest to create a significant biofuels industry based only on today's land use practices using currently available agricultural and forestry resources. But if municipal solid waste is used in conjunction with these existing resources, the region can produce 10 to 15 percent of its transportation fuel from indigenous resources. An even larger industry can be created with new land use practices and the identification of new energy crops. "With a growing demand for transportation fuels and constrained petroleum supplies, there is a growing need for a significant biofuels industry in the Northwest and across the country," said Mike Davis, who leads PNNL's Energy and Environment Directorate. 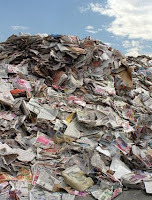 Municipal solid waste is one source for our future fuel. In 2004, Oregon and Washington residents generated 8.2 lbs and 7.5 lbs per person per day respectively. According to the report, the organic fraction of the waste constitutes 70 percent of the region's currently available biomass.